learn more about this exciting series! OUT OF RESEARCH PAPER SUCCESS! A PHENOMENAL RESOURCE — ORDER TODAY! 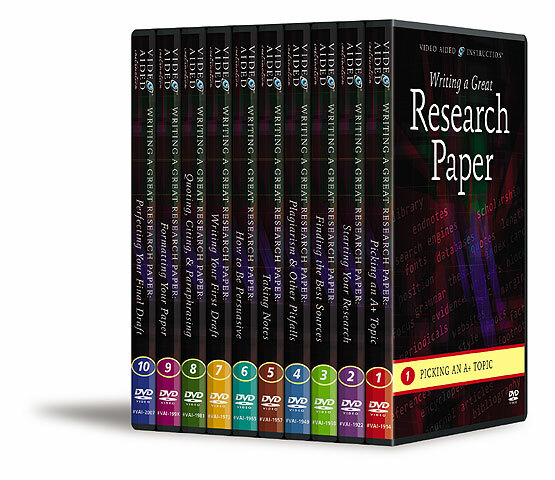 Finally, an easy-to-use resource that guides students along the entire process of writing a great research paper! 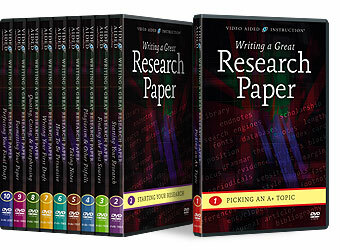 Video Aided Instruction’s brand new Writing a Great Research Paper DVD series is your step-by-step guide to constructing a paper that’s technically correct, refreshingly original, and truly compelling! Best of all, the strategies you’ll learn will apply to any research paper assignment — in high school, college, graduate school, and beyond — in English... history... psychology... sociology... education... political science... economics... business... science... the arts... you name it! actually write a great research paper! NOTE: The 10 DVDs in this series make ideal self-study aids (perfect for circulation by school, college, and public libraries and writing centers). They’re also the ultimate resources for educators (teachers, professors, administrators, etc.) who wish to further their own professional development, provide in-service training for their staff members, improve their command of modern research techniques, or supplement and enhance their classroom lessons. succeed in their studies, achieve their goals, & fulfill their dreams! Copyright ©2009 Video Aided Instruction, Inc. All Rights Reserved.